If I start my workday on the couch, I will be 100 percent less productive than if I start the day from my office. Okay—so I made up that percentage. But the point still stands; for me to have a creative, focused, and productive workday, it’s necessary for me to do my work in a clearly defined office space. 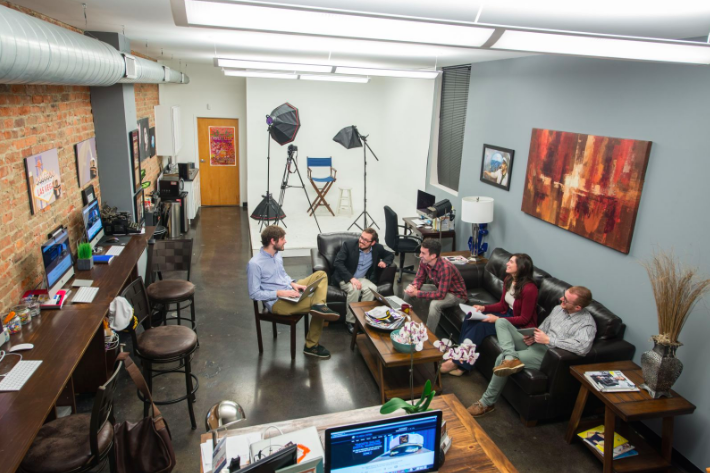 When it comes to producing good work, the couch just doesn’t cut it. The environment in which we work is crucially important. While there are different schools of thought on the value of open-plan offices versus more private arrangements, it is at least accepted that our work environment does have an impact on our overall performance and output. Not only that, but our preferences when it comes to workspaces are highly personal; what works brilliantly for one employee might not work as well for the next. How do successful entrepreneurs work? 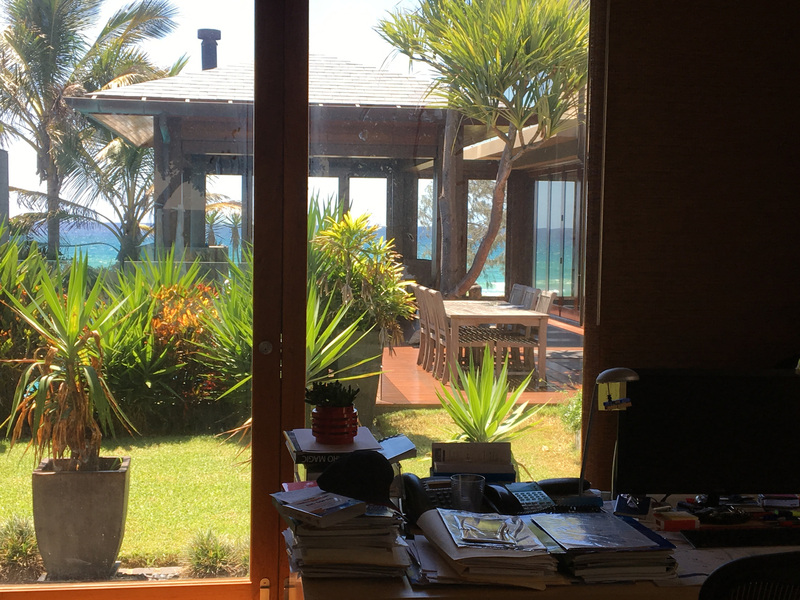 With this in mind, I reached out to entrepreneurs with a simple question: What does your workspace look like, and why does it make you feel productive, creative, and inspired? Katie Johnson at her standing desk. Standing desks are growing in popularity, and the benefits of using one during at least a portion of your workday are well-known. With office workers leading an ever more sedentary lifestyle, making an effort to sit less has been connected with lowered heart disease, diabetes, and cancer risk, among others. Katie Johnson of StandDesk.co (unsurprisingly) agrees, and is a huge advocate for integrating standing desks into the workplace. 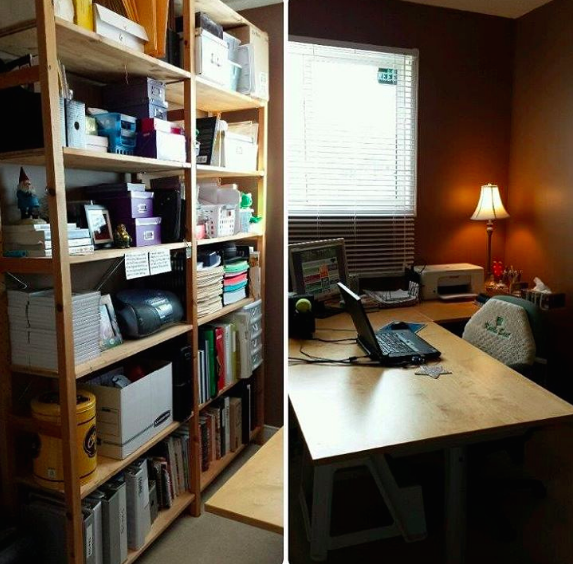 “My workspace is ideal for me because it supports my changing needs and gives me options. 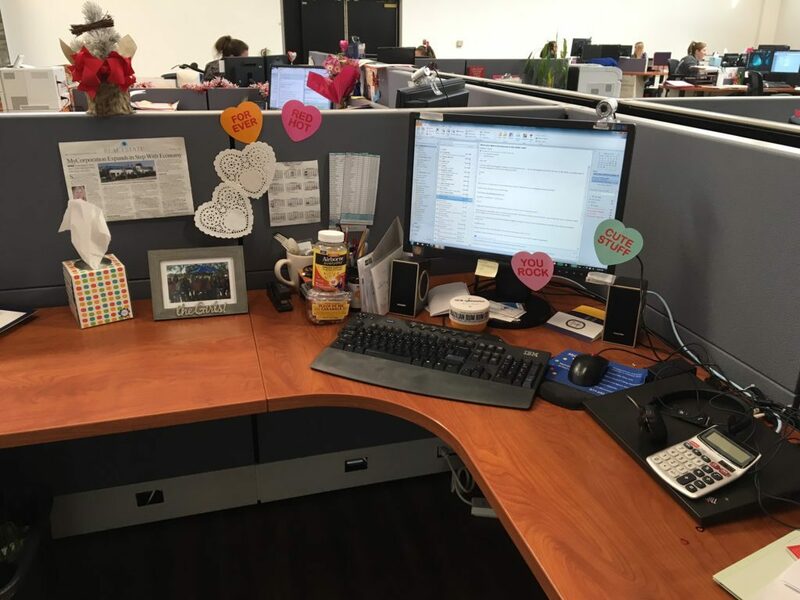 My workstation allows me to sit or stand depending on how I’m feeling—if I need an energy boost, I stand, and if I need some support, I sit,” she explains. 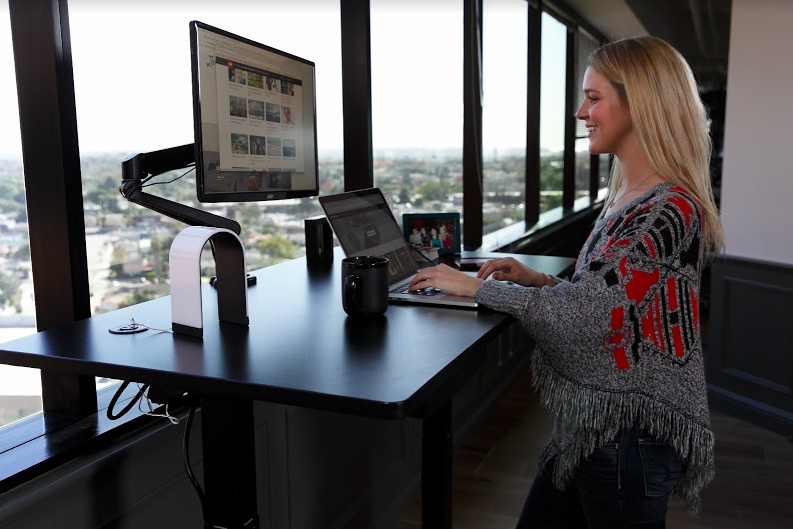 She also highlights the importance of having a desk that is flexible enough to support a variety of workstyles, beyond simply the need to both sit and stand. Johnson’s main priority? A workspace that remains flexible and can be customized to suit her needs as they shift throughout the day. Stacey Chang in her office. Your workspace should be a place of inspiration, ideally a place where you feel energized and motivated to create your best work. Samson Adepoju at his coworking space. 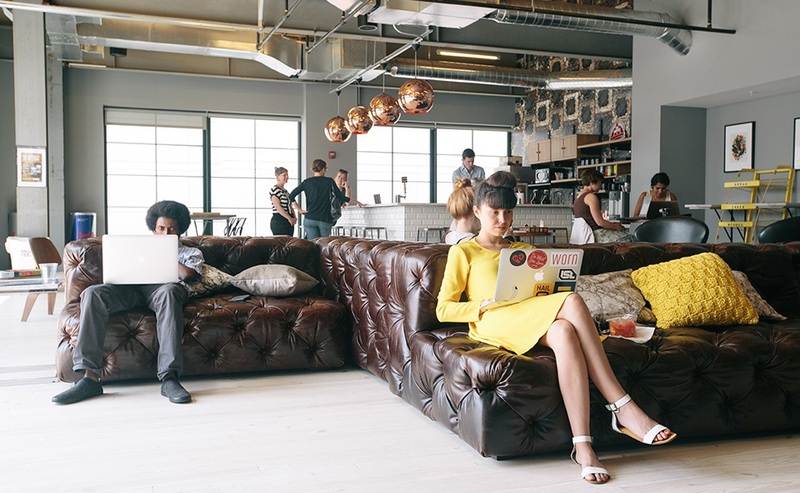 For the remote employee, freelance worker, or bootstrapped entrepreneur, coworking spaces are hugely appealing. After all, as I mentioned earlier, it can be difficult to focus from the living room couch. To that end, Samson Adepoju of Salon Your Way takes advantage of coworking spaces, as opposed to a set home office or office building. 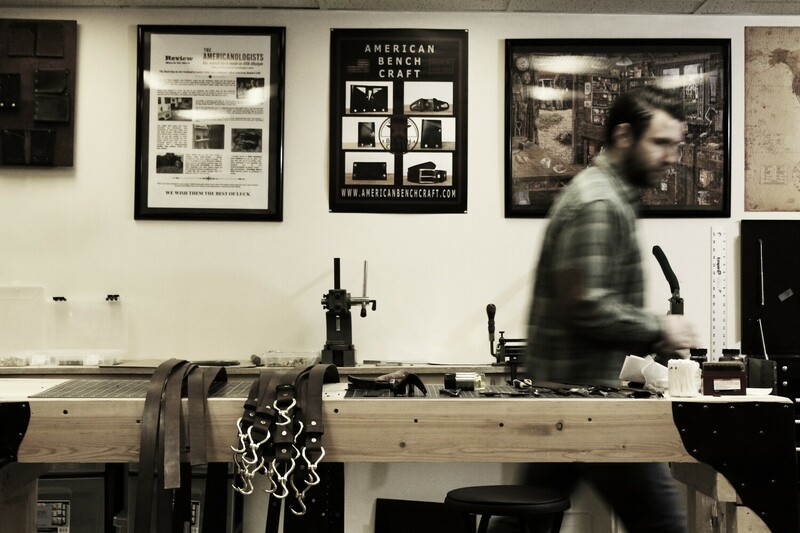 The American Bench Craft workspace. Some workspaces weren’t meant to be orderly and tidy; for some, a little chaos is the best possible work environment. While you won’t find much advice urging you to emulate natural disasters with your office setup, Angelini wouldn’t have it any other way: “A messy workshop is a busy workshop, though, so we like the mess,” he says. 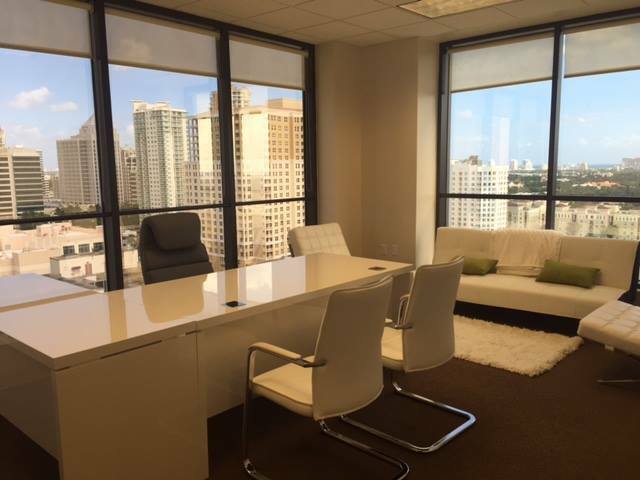 While open-concept offices are still the trend, it isn’t all airy lofts. 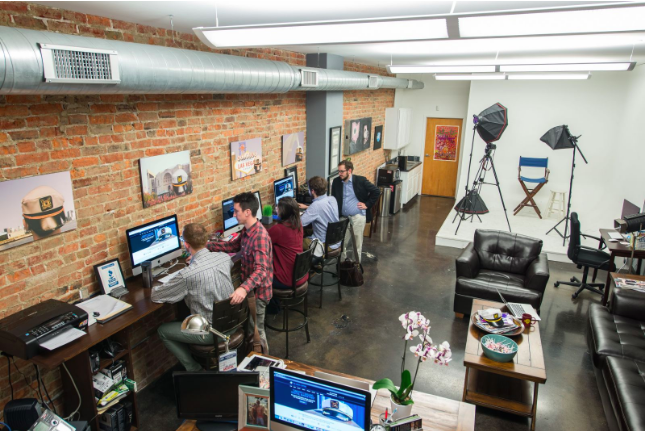 “We have an open office space located in the heart of the Short North Arts District in Columbus, Ohio, which is in the downtown area,” says Jason Parks of The Media Captain. Your office is your home away from home—so it makes sense to bring your essentials along with you. If you work from home, having a designated office space is more important than ever. 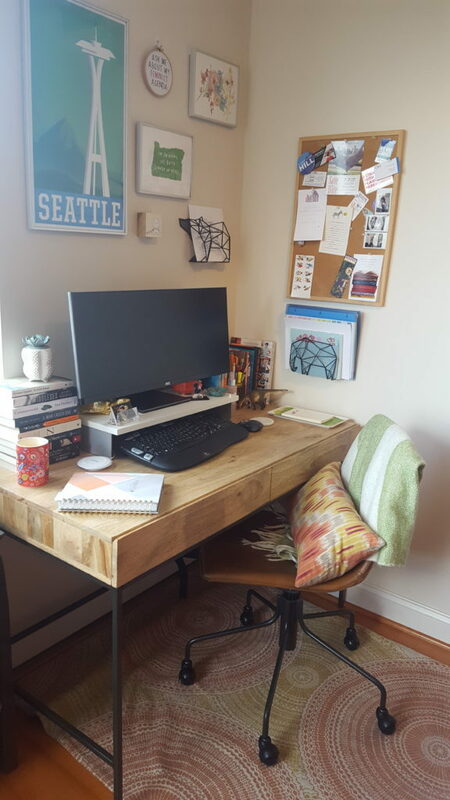 Without at least a small corner of your home as a devoted workspace, it’s harder to stay present when it comes to work tasks, and productivity often suffers (and I say this from personal experience as someone who works from home!). In the same vein, if you work from home, it can be easy to feel cooped up, and cabin fever can set in quickly. That’s why it’s important to either get outside as much as possible, or take a leaf out of Julie Frost’s book, and bring the outside to you. Frost also notes that in her line of work, the access to natural light is irreplaceable. “As a freelance designer of all sorts of things […] the ability to perceive and determine real color in natural daylight from within a workspace that lets me stay in touch with what’s going on outside is important to keeping me focused and creative,” she says. 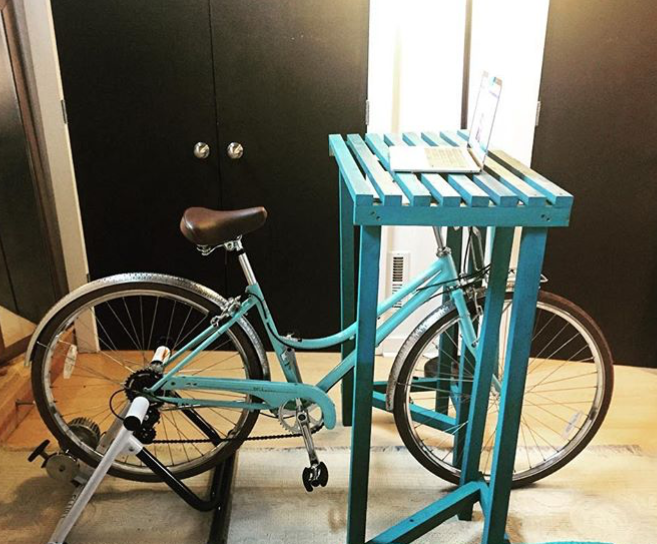 So, you’ve heard of standing desks—but have you heard of bike desks? Honestly, I hadn’t—until I went down to work in-office at Palo Alto Software and discovered that we actually have one! Erin Jump Fry in her office at Fancy Fortune Cookies. 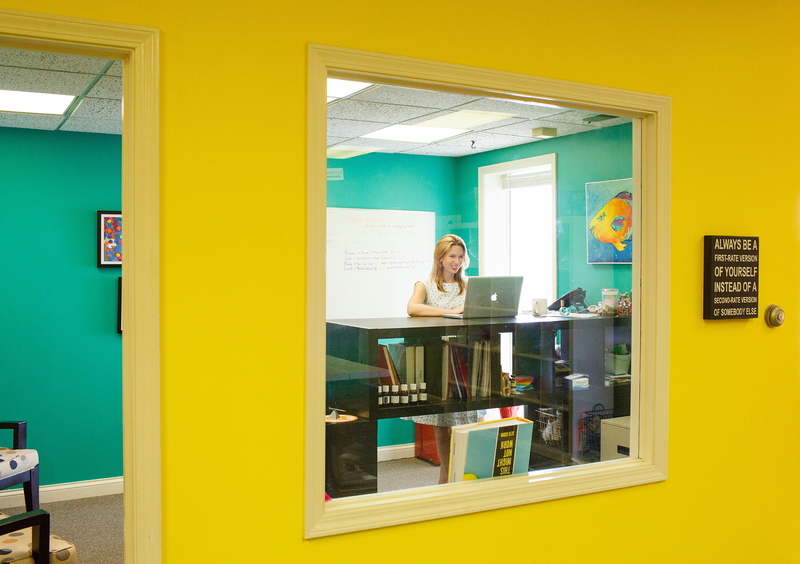 What do you personally think is most important when it comes to creating a productive, inspirational workspace? Which workspace would you love to work in? Leave me a comment and let me know! Or, better yet, share this article on Twitter or Facebook and let me know what you think. 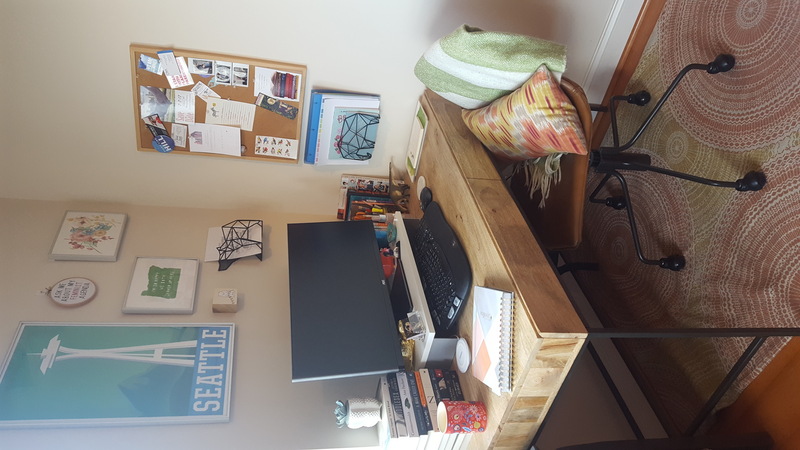 I’d love to see your own office setup too—share it with me on Twitter @BrianaMorgaine!